If you have a migraine, should you visit a chiropractor or an applied kinesiologist? Chiropractic care is known to be among the best treatments available for the treatment of neuro-musculoskeletal issues; nerve, muscle, bone and joint issues. The premise behind chiropractic care is that maximizing the functionality of the neuro-musculoskeletal system the body will be able to achieve peak performance. Chiropractoric treatment involves mobilizing joints, massaging muscles and reducing joint inflammation through physical modalities (electric stim, ultrasound, heat, etc.). While some may debate chiropractic effectiveness, research study after study ranks it among the safest, cost effective and effective treatments. But what do you do if traditional chiropractic or medical care doesn’t relieve your neuro-musculoskeletal pain. Many people do not know that the chiropractic profession has specialities and advanced training just like the medical profession. Post graduate degrees called Diplomate programs a include; neurology, radiology, nutrition, pediatrics and more. There are also advanced studies programs available with Applied Kinesiology being one of the oldest with over 50 years of research. 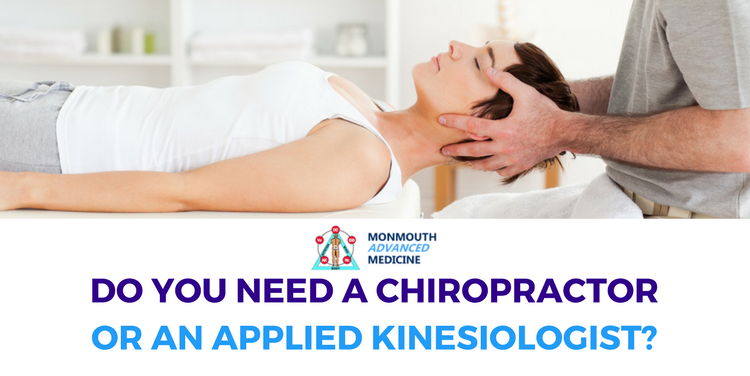 Applied Kinesiology (AK) is a series of diagnostic and treatment protocols designed to maximize how the whole body functions as a single unit. AK builds on the strong neuro-musculoskeletal base of chiropractic care by utilizing muscle testing to pinpoint where dysfunctions are occurring. Applied Kinesiology’s diagnostic and treatment protocols evaluated by muscle testing insures a more precise and effective treatment plan. An example, a patient complains of chronic headaches linked to stress and neck pain. An MD may recommend a muscle relaxer, a PT may use physical modalities to relax the muscles and a Chiropractor may adjust the neck and massage the muscle to maximize function in the area. A Chiropractic Applied Kinesiologist would be able to determine if the headaches are from the neck or maybe from a more complex problem including; TMJ, nutrition, stress, sensory input or dozens of other causes. So do you need to see a Chiropractic Applied Kinesiologist? Yes, if you want to determine the underlying cause and experience a more thorough healing of your neuro-musculoskeletal pain.